Imagine the scene; midnight, stomachs are rumbling and a near empty fridge is staring back at you. 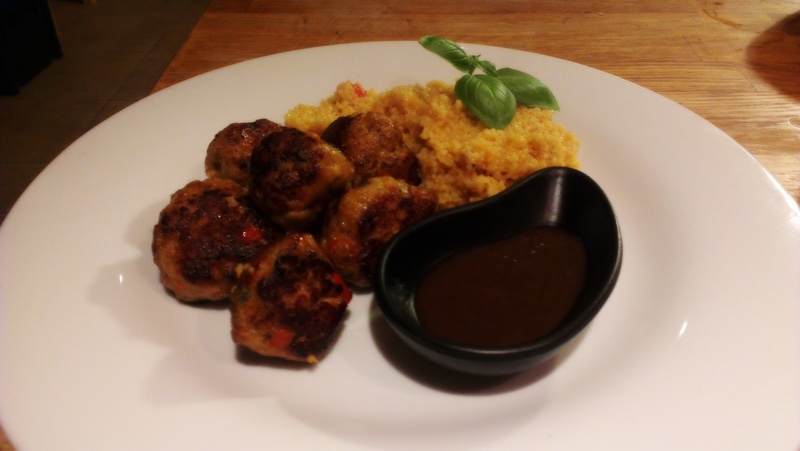 This is the situation in which these meatballs were made but doesn’t discredit them! They went down an absolute treat with a splash of Oxford Sauce. And as always, these are just suggestions. If you have some other things knocking around in your fridge ready to go off chuck them in! In a bowl combine all of the ingredients except the flour. If you really want them mixed and don’t like large chunks, use a food processor. Just be aware this will make the consistency wetter. Cover a chopping board with flour coat your hands. 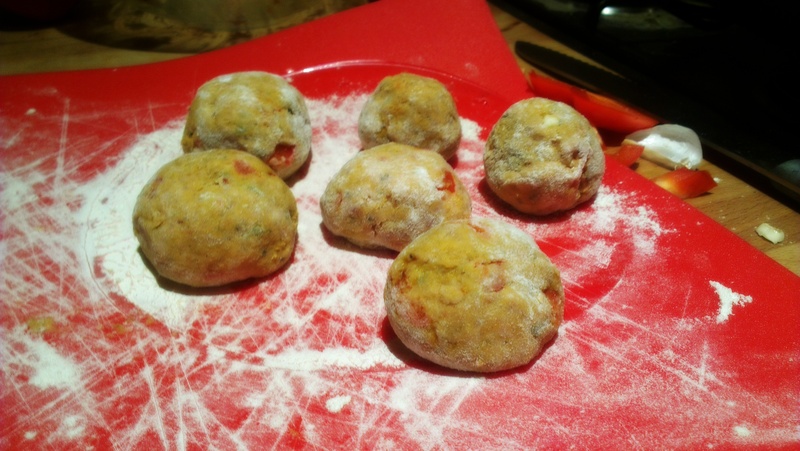 Form the mixture into fairly even sized balls by rolling in your hands and on the board. Fry in a little oil, rolling and turning the meatballs to get even coverage. To test if they are cooked, slice the largest one in half and check the middle – if it seems piping hot and is the same colour as the rest then they are done. Serve with some kind of sauce for moisture. We also did a bit of spicy cous-cous for some nice carby accompaniment. 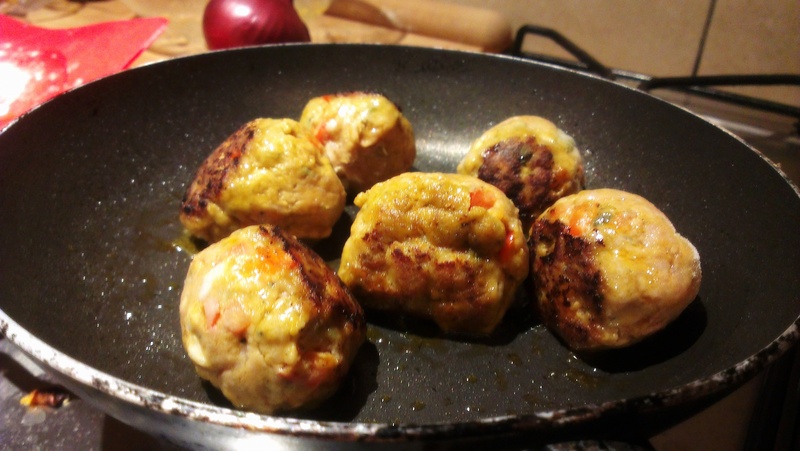 These are best served fresh, but by all means store the uncooked meatballs in the fridge until the use-by date of the sausage meat or in the freezer. Cooked they will last around 2 days in the fridge. 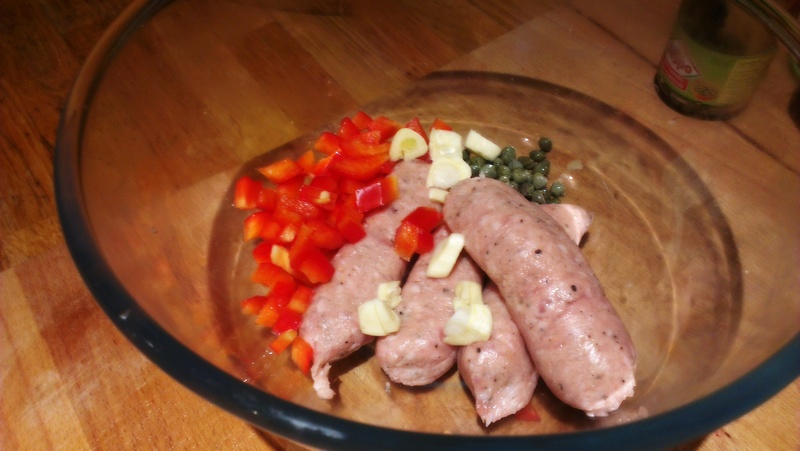 Posted in Guesscipes, Pork, Sides and SnacksTagged curry, guesscipe, hot dog, meatballs, pepper, pork, recipe, sausage, spicyBookmark the permalink.